Born Marsala, Sicily, Feb. 3, 1898. Killed Chicago, IL, May 26, 1925. Angelo Genna was born Feb. 3, 1898, in Marsala, Sicily, to Antonino and Mary Sancore Genna. He and his brothers entered the U.S. through New York around 1910. Angelo arrived in New York harbor on Aug. 5, 1914, aboard the S.S. Venezia. He was on his way to meet his brother Pietro, of 870 Blue Island Avenue in Chicago. The Gennas became a close knit Marsala-based Mafia and bootlegging gang. They were closely allied with the more Americanized Spignola family of Chicago. Their gang feuded with the budding underworld organization of Alphonse Capone through the early 1920s. The conflict was a bloody one. Angelo Genna was tried and acquitted for one murder, accused but not prosecuted in another murder. Beginning in November of 1923, he served a sentence of one year and one day in Leavenworth Prison for intimidating a witness. 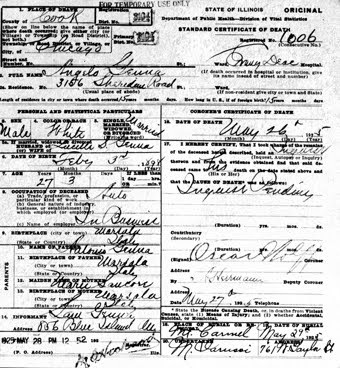 Genna married Lucille Spignola, sister of his ally and business partner Peter Spignola on Jan. 10, 1925. The wedding was lavish, with three thousand guests and a two-thousand-pound wedding cake. On May 26, 1925, Genna was shot numerous times as he drove his automobile. With serious wounds to his head and neck, he crashed the car into a lamp post at Hudson and Ogden Avenues. He was conscious as he arrived at the Evangelical Deaconess Hospital. Police urged him to tell who shot him. Genna merely shrugged. He died shortly afterward, as his brother Sam, wife and brother-in-law arrived at his bedside. Genna was buried May 29, 1925, in Mount Carmel Cemetery in Chicago. More of the Gennas lost their lives in the days ahead, and the remaining brothers fled Chicago. Their departure allowed the Aiello clan - originally from Bagheria, Sicily - to dominate the Sicilian underworld of the region. Writers of Wrongs: Chicago's Genna is laid to rest.